Spokane couple Ryan and Heidi Miller's wanderlust-tinged design venture, 08 Left, is a finalist in a national competition run by Martha Stewart's homemaking empire, called Martha Stewart American Made. The Miller's 08 Left is running in the design subcategory of furniture and home accessories, alongside dozens of other makers and artists. This is the second year the couple has entered their work into the competition. Even if it's not selected by Stewart's panel of editors and judges, 08 Left still has a chance to be named overall audience choice winner, as voted by the public. The annual competition, running since 2012, seeks to highlight makers, artists and entrepreneurs across the U.S. who are designing and crafting quality products by hand. There are 26 sub-categories within the contest's major focuses on crafts, design, food and style. Although 08 Left launched last year, the couple are just now showing their contemporary, airport themed art to the local public at tonight's Terrain 8 arts showcase. A graphic designer by trade, Ryan Miller's love of travel and all things relating to flight is the theme of 08 Left (the project's name refers to a runway destination in airport-speak). 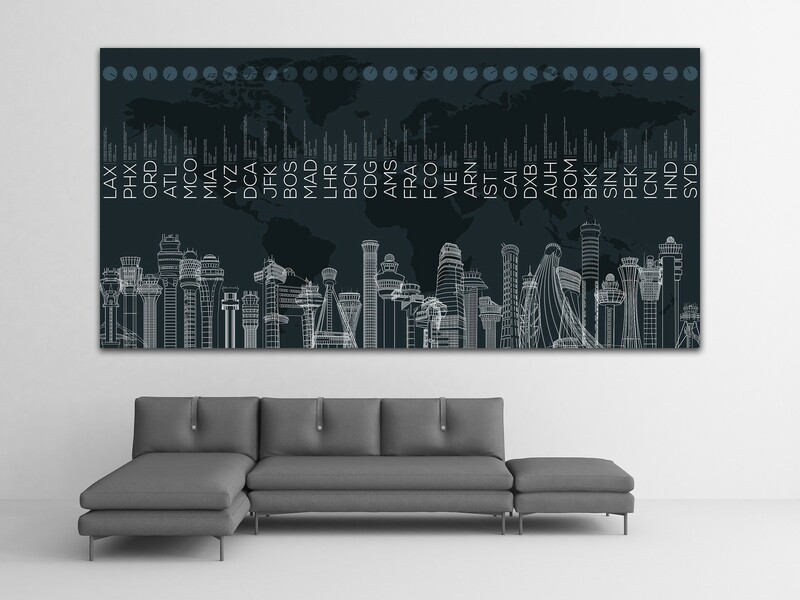 Minimalist airport layouts, three-letter airport codes, and finely outlined silhouettes of airport traffic control towers from around the world (including military bases) are showcased on poster prints, throw pillows, T-shirts, coasters and printed onto sheets of metal as industrial-inspired wall art. "All my life my husband has been obsessed with airplanes — he should have been a pilot instead — and every time we would travel he would stare at airplanes and he knew all the airports so well," explains Heidi Miller. "He's in awe of the whole design of how an airport functions — he just nerds out about it." While 08 Left's artwork may be a new discovery for many Inland Northwest residents, the couple's work has been picked up by several design-centric blogs and websites, including Houzz, Dezeen magazine, Mashable and Gizmodo. However, some may recognize the Millers for their longer-running, custom card and invitation company, Mango Ink. 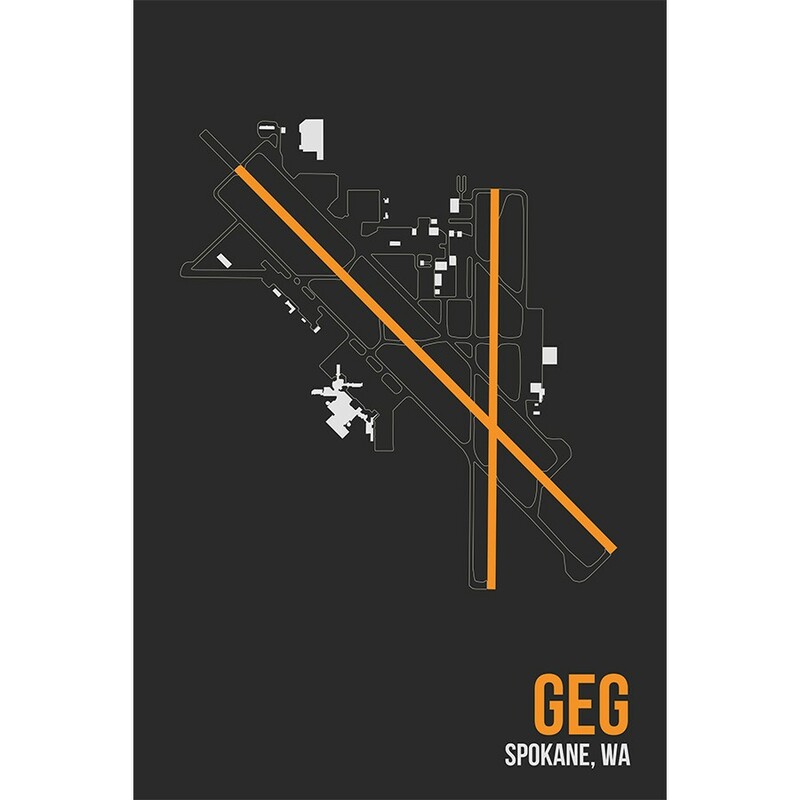 Attendees of this year's Terrain arts showcase can see the Miller's 20-by-30 print on metal of the Spokane International Airport, aka GEG, tonight — the event runs from 5 pm to 2 am. It's located near the stairs leading to the second floor, in a narrow hallway. While the piece on display has already sold, Heidi says fans of it can order their own version through 08 Left's website. Prints are customizable by color, she adds, so if the original design doesn't match your decor, let them know. If you'd rather pay homage to another airport around the world, the couple also accepts commissions. But with 350+ designs to choose from already, it seems likely you'll find what you're looking for. "People who travel want to collect the places they've been, and it's this interesting collection of ways to interpret the world and how beautiful it is, and how the airports are a gateway to that and those places," Heidi reflects.